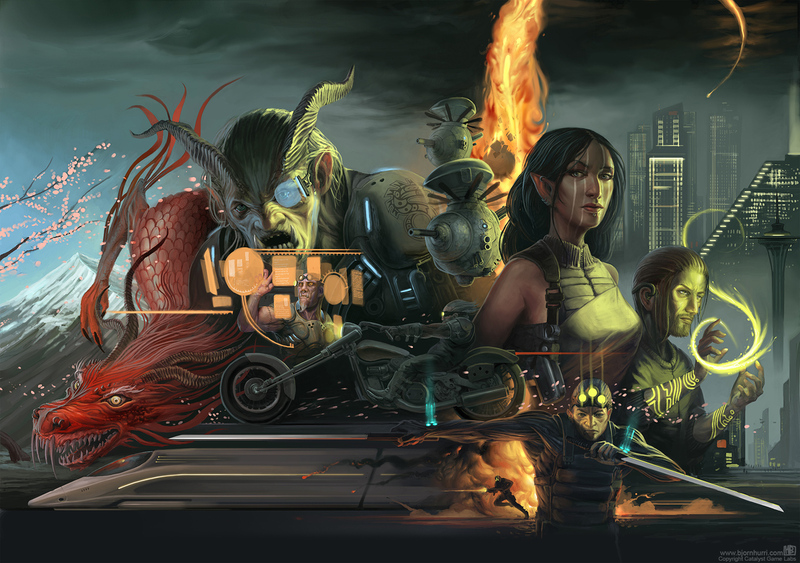 Introducing Our New Weekly Shadowrun Tabletop Role-Playing Adventures! Last year my friends and I gathered together with the power of Skype, Roll20, Google Sheets and .PDFs to fulfill a longstanding desire to play tabletop role-playing adventures over the internet. We’re all in our 30s and my closest friend lives 200 miles away, with the farthest living several states over. We see each other about once a year during a glorious New Year’s Eve get together where we mostly play board games. Despite our love of everything nerdy and game-y we missed out on playing traditional pen and paper role-playing games growing up. I was the only one with any experience with Dungeons and Dragons (2nd edition) and even I’d only played a handful of sessions. We started up an official weekly, live streamed role-playing group playing Pathfinder last year, and it was an absolute blast. Unfortunately over the course of a few months we only got through one complete dungeon crawl and were halfway through a second adventure before our GM dropped out due to personal reasons. Fast-forward several months and we’re back ready to tackle the awesome virtual role-playing utility that is Roll20 and go on more adventures, with two major changes. First, I’ll be the Gamemaster! Our old GM is still MIA and I’ve always fancied myself the creative story-teller type. Also as a stay at home dad and part time writer I generally have the most time among my friends to devote to this venture. The second big difference is we’ll be playing Shadowrun Fifth Edition. Even while we were in the midst of playing Pathfinder (which is basically just DnD) I talked about how If I tried my hand at being GM, I’d definitely do Shadowrun. Though it has existed since the 80s I’d only tangentially heard of Shadowrun growing up. I had seen the box art of the old Genesis and SNES games but never played them. I thought the cyberpunk motif was cool but at the time was balls-deep into the fantasy worlds of Dragonlance, Discworld and the Forgotten Realms. 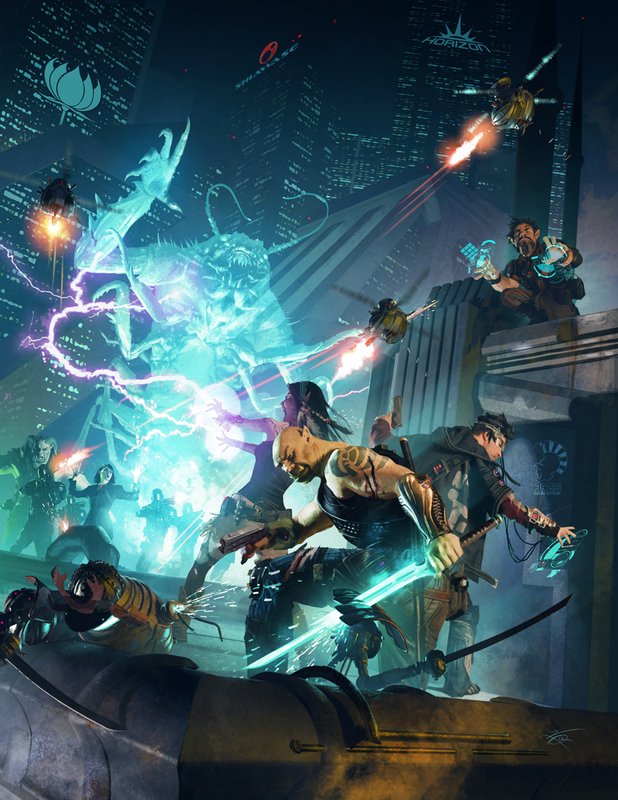 It wasn’t until Harebrained Schemes ran their successful Kickstarter project to create a new tactical Shadowrun game that I began to take interest. While I didn’t back it at the time, I bought and played it right when it came out in the Summer of 2013 – sneaking it onto my backlog gaming schedule. I loved that game, but even more I loved that universe and the concept of urban fantasy + cyberpunk. Dystopian mega-corporations ruling the world, whole sections of cities run by gangs, easy access to drugs and weapons – it was all very much 80s sci-fi and I adored it. We read through the Quick Start Rules and got together to choose from the pre-generated characters and learn about the game. I crafted the one-module beginner adventure (Food Fight) in Roll20 and we had our first session last week. I didn’t live stream it as it was still very much a learning experience for everyone involved and didn’t want the added distraction. But I did record and upload it to my YouTube channel in case anyone wants to go back and see Where It All Began. Next everyone will be creating their own characters and we’ll spend our next session going over character creation for the first time. Since one of our runners will be taking a lengthy vacation at the end of March, we won’t be officially starting our weekly live streams until April. The plan is to live stream every Sunday evening starting at about 9:30pm Central and running for 2-3 hours on my twitch channel. I also plan on uploading each session to YouTube (broken up into easier size chunks if I have time) as well as recapping them here on my blog. I really look forward to this fun new way to hang out with friends and family every week, and I’d like to keep it up for as long as we have fun with it. See you in the shadows, chummer. I watched Lost Mine of Phandelver and Princes of the Apocalypse, and it’s neat seeing how this all began. Even when you all are struggling with rules and Roll 20, you’re still fun to watch. Too bad Shadowrun’s rules are so bad. Have you considered developing your own fantasy noir setting with better rules? Thank you for the kind words, Jason. Honestly at this point if I wanted a cyberpunk/noir setting I’d just modify the existing D&D 5e rules to make it work. It’s such an effective system and seems very modular, and we’re all very familiar with it at this point. That being said, I’ve also glanced at Starfinder and found that running a purely sci-fi RPG could be pretty nifty as well….